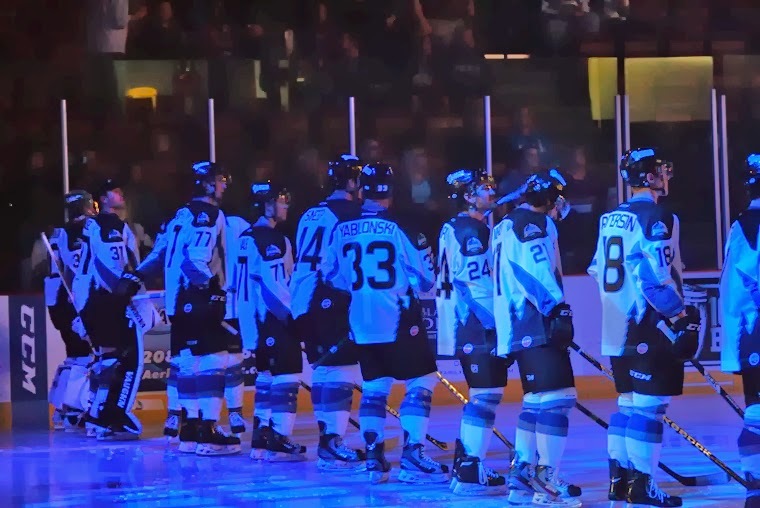 Two shootouts and two different results for the Idaho Steelheads this past weekend as they lost to the Ontario Reign 4-3 in a shootout on Friday night and then returned the favor with a 4-3 shootout win over those same Reign (Manchester Monarchs; St. John’s Ice Caps) on Saturday. First a couple of observations from both the games. This Steelheads team has a never say die attitude so far this year at home. This season in three home games they have had to come from behind in each game and have been able to salvage five points out of those games with all three going into overtime. Pat Nagle continues to improve. Despite allowing a goal 28 seconds into the game on Friday and a goal at the 5:53 mark of the first on Saturday, Nagle played well enough to keep the Steelheads in the game and allow them the chance to comeback to earn points both nights, With this offense, the Steelheads should be able to average over three goals a game for the season which should be good more often than not. Pat Nagle needs to be in the ECHL. There was some thought that with Cristopher Nilstorp being “unavailable” and since Josh Robinson was already called up, that the Texas Stars would follow that up with a call to Nagle. That didn’t happen as they went to Evansville to pull Allen York up on a PTO. However after seeing Nagle for two games this weekend, there are clearly some things that need to be worked on, and his best chance to improve and be successful in the AHL will be with quality time at the ECHL level. Don’t put the Steelheads on the power play at home. The Steelheads were 4 for 9 this weekend on the power play which brings their season numbers up to 6 for 11 on the season. Mitch Wahl is the main reason for that home success as he currently leads the league in power play points with 6. Unfortunately for Steelheads fans, the AHL has taken notice of that and as of Monday Wahl was loaned out to the Utica Comets. Ryan Button: Over six games played he is currently sitting at three points (1G, 2A) and has a plus-3, which leads all Steelheads defenseman. He is a guy that you really haven’t noticed when he is on the ice, and that is a good thing when you are a defenseman. Very solid player so far and has earned some extended ice time. Etienne Boutet: Has played in four games so far this season and has registered 1 assist as he helped set up a Taylor Vause goal over the weekend. Other than that nothing all that remarkable. Just another solid player who sits at even on the plus/minus chart. Taylor Vause: Vause to me had his best weekend of the season against the Reign. The score sheet will only have him credited with two goals (both Saturday including GTG) but his energy and pressure on the penalty kill was clearly a force to be reckoned with and one of the reasons the Reign went 1 of 8 on the weekend. Brock Montgomery: Has only registered two assists so far on the season, but he continues to work in the corners trying to get to loose pucks and doesn’t seem to be afraid to use his 6’1” frame to do it. A little rough around the edges, but with a bit more seasoning could become a force as a power forward. Coming up next week for the Steelheads are a three game set with the Alaska Aces (Abbotsford Heat) as they make their way to Boise on Wednesday, Friday and Saturday. I’ll take a look back at those games and dive into a few more Stars contract players.